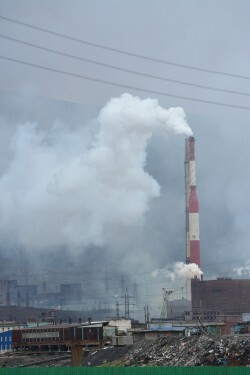 Unhealthy air-quality from a factory wrapped in pollution continues in Nikel despite closure of similar melting technology in Norilsk for environmental reasons. Last week was bad for environment in Russia’s border town to Norway. On July 5th Murmansk Department for Hydrometeorology and Environmental Monitoring measured 10 times higher levels of sulphur dioxide than maximum allowed. The day after, the pollution exceeded federal limits by 7,4 times. All data are posted on the department’s portal. During the weekend, the plant had to temporary reduces production as concentrations of air pollution were increasing. Unfavorable weather conditions are to be blamed for the accumulation of pollutants in the atmosphere. In other words; little wind to spread the smog out of populated areas. The Bellona Foundation, an environmental group focusing on the area, updates the dedicated Facebook page Stop Norilsk Nickel Pollution with measurements from the portal of Murmansk region’s Hydrometeorology service. Last week, the Barents Observer reported about the closure of the oldest nickel-plant in Norilsk on the Taimyr Peninsula in Siberia. The plant, by far the worst air-polluter in the Arctic, was closed because its technology was hopelessly outdated. “… a continuation of production would be dangerous from the standpoint of environment and labor protection,” Lenta reported from the closure. Parts of production of pure nickel will be moved from Norilsk to the combine’s plant in Monchegorsk on the Kola Peninsula. The plant in Monchegorsk also gets nickel matte from the old factory in Nikel. Air pollution from the smelter in Nikel has for decades been a torn in Russian-Norwegian relations. Since 1993, the Nikel pollution has been at the top of the environmental agenda of the Barents Cooperation. Norway granted NOK 300 million (€40 million) to assist with reducing the emissions. At the year of the 10-years anniversary of the Barents Cooperation in 2003, a list of environmental hot spots in the Russian part of the region was defined by the Nordic Environmental Finance Corporation (NEFCO) and the Arctic Monitoring and Assessment Program (AMAP). Nikel is one of the most severe spots on the list and can still get financial loans and support from Nordic financial mechanisms to solve the problem there. However, after hundreds of technical and political meetings concerning Nikel since the early 90ies, Norway withdraws the grant in 2009. The receiver simply didn’t want to modernize the smelter in Nikel.